Fashion Herald: More Give and Get at Gap, Inc.
Last go-round, this was quite a successful campaign. 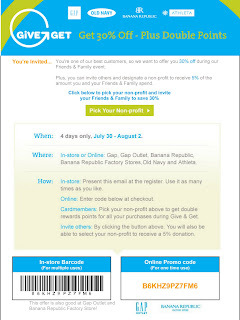 So sign up again this week and get 30% off purchases at Gap, Banana Republic, and Old Navy from July 30 - August 2nd. 5% of your purchase goes to one of Gap's non-profit charity partners. Click the flyer below to print and get codes, and choose your charity and read official info here. Save and shop for charity, that makes for a very fulfilling weekend, right?! 30% off. Ooh, tempting. Must click over to BR.